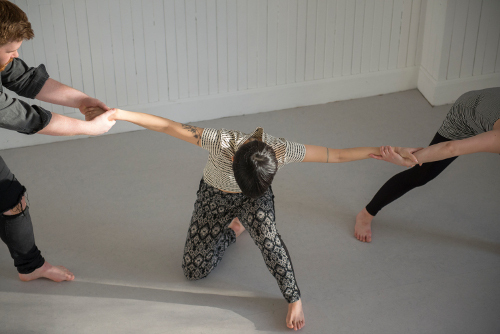 in threes is a highly physical, truthful and evocative contemporary dance performance which looks at different aspects of human behaviour, communication and memory. Three Toronto premieres are weaved together creating a seamless production which includes the work of notable Choreographers, Alison Daley, Miles Gosse, and Tracey Norman, alongside the performance work of Half Second Echo and guests. All of these artists have wowed Fringe audiences and critics in years past both individually and collaboratively. All collaborators have had hit Fringe shows which have had huge audiences and been extremely well reviewed in major publications; the most recent example being WILD/WALLED at the Toronto Fringe Festival 2017.